Khyungpo Naljor (Tib. ཁྱུང་པོ་རྣལ་འབྱོར་, Wyl. khyung po rnal 'byor) (c. 1050-1140) or (990-1139) — the founder of the Shangpa Kagyü tradition. He took full ordination with Geshe Langri Tangpa and travelled seven times to India from Tibet, bringing back many teachings from masters such as Niguma, Sukhasiddhi, Rahulaguptavajra, Maitripa and Vajrasana or Abhaya. He made his seat in a place called Shang in the Tsang region of Tibet. 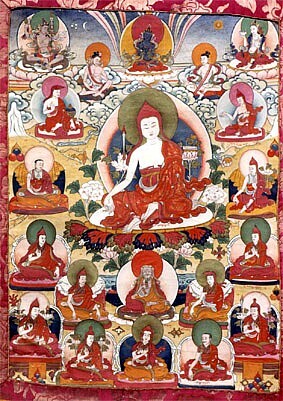 He was therefore known as the Lama Shangpa. He founded over one hundred monasteries in Tibet and taught tirelessly, manifesting many miracles. He is said to have lived for 150 years. This page was last edited on 22 November 2017, at 01:29.